One of my mantras is that "Creativity cannot exist in a repressive environment." The North Koreans simply don't have the environment to foster decent hackers. Sure, NORK "script kiddies" can launch DDoS attacks on select targets, and they might even hold relatives of South Koreans hostage to lever themselves into media outlets in the South. But to break into to Sony Pictures so thoroughly? Get serious! Any smart cyber brains in the North have their IQs cut in half out of sheer fear of their emotional-pygmy leader. So my serious advice to the FBI is…yup…follow the money and find out who broke into Sony and sold the goodies to the Un-geniuses. Oh, wait. The FBI is barely qualified to compete in a cyber version of The Special Olympics. And the NSA isn't about to give away their inventory of Zero-day exploits. So again, Sony, my advice is to CALL THE MOSSAD. The former North Korean dictator's kidnapped a director and his actress-wife, held them captive separately for five years, and finally hired them to make North Korean films. Kim's obituary only makes passing reference to the kidnapping of South Korean filmmaker Shin Sang-ok and his Choi Eun-hee in 1978, but a 2003 Guardian article on the bizarre incident goes far into what transpired between the dear leader and Shin in the eight years before the filmmaker escaped North Korea for good. After being kidnapped, Shin -- who had been described as South Korea's answer to Orson Welles because of his groundbreaking film working during the '60s and '70s -- tried to escape, which landed him in Prison No. 6, a place where he was fed grass, salt and rice for four years. Then, out of the blue one day in 1983, Shin was released and reunited with his thought-to-be-dead wife at a reception, where Kim presented the pair with his vision for the future of North Korean filmmaking. "The basic duty of the creative group is to make revolutionary films of high ideological and artistic value, which make an effective contribution to arming people fully with the Party's monolithic ideology and which imbue the whole of society with the great Juche idea." Following his "release," Shin made seven films with Kim Jong Il -- who acted as executive producer -- including 'Pulgasari,' a North Korean take on 'Godzilla' that the Guardian once described as a "terrifically bad movie." So the source is a SONY employee who voluntarily or involuntarily has facilitated the entry. perhaps. 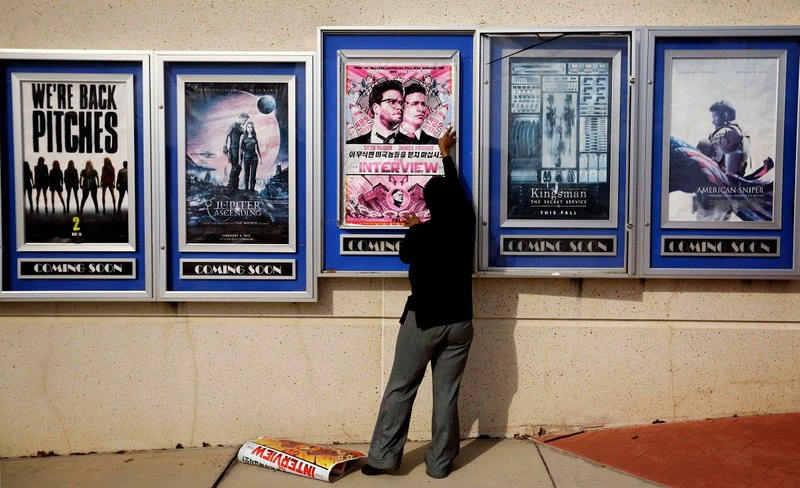 As 'The Interview' is pulled, does this mean North Korea wins? Few years ago a South Korean warship was sunk and nothing happened. Several sailors died. What can you do with a government mad protected by the Chinese ?